The holidays: that magical time of year when even non-planners start making lists and coordinating schedules. In an attempt to do our part to make some of that easier, we've compiled our 2018 list of the 15 best gifts for planners of all kinds (in no particular order). From fun to functional, informative to instructional, we've tried to ensure that there's something for everyone. So...whether you're looking for items to add to your own wish list or need help finding just the right thing for someone who always seems to be one step ahead, read on—and happy holidays! Plan for the unexpected! Recently improved, the new Wallet Ninja boasts 20 different tools, including screwdrivers, wrenches, bottle and can openers, rulers, mirror, letter opener, and even a cell phone stand! It's made of durable heat-treated steel, weighs less than an ounce, is the size of a credit card, and even meets TSA requirements for air travel. It also comes in either black or pink. Don't just dream about "someday;" create a plan and track your progress toward those life achievements before you kick the...well, you know. 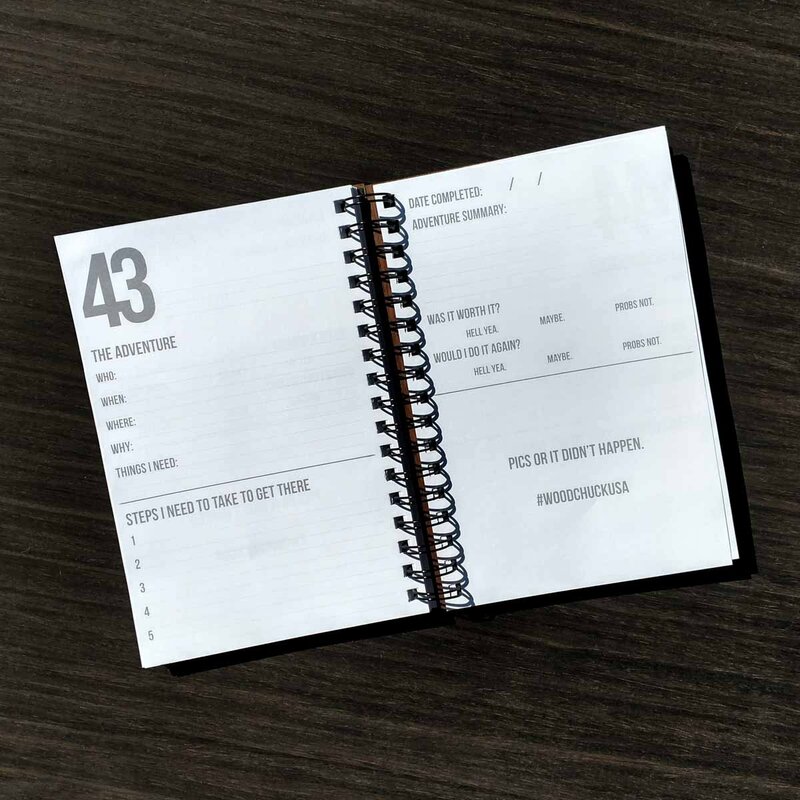 This handmade 6" x 9" journal from Woodchuck USA has a genuine wood cover and pages that let you list your goals and the steps toward achieving them as well as providing the space to document them when they happen. Bonus: for each item purchased, Woodchuck plants a tree elsewhere in the world—which is planning we can get behind! The number of books with ideas that change our lives, businesses, and culture—and affect our plans—is only increasing. Blinkist can help you stay on top of it all. They consolidate the main ideas from bestselling nonfiction books into text and audio that you can easily absorb during a single commute. Jumpstart your personal growth with their library of over 2,500 titles (more added each month) in areas like Communication Skills, Management and Leadership, History, and Psychology. We've all felt that helpless feeling of dwindling productivity while trying to work on bad hotel wifi. This neat gadget will either boost an existing wifi signal or create a hotspot out of a wired ethernet connection. It's also an international power adapter and USB charger. If you've listened to a podcast or two, you're probably already aware of these subscription services. Some (Blue Apron, Hello Fresh, etc.) send you full meal kits, complete with ingredients ready to go; others (like Prep Dish) plan your menu and provide a grocery list and preparation instructions. There are a myriad options for every dietary preference or need, every level of kitchen experience, and every budget. Whether all the time or just during a busy season, letting someone else handle your meal planning can free up bandwidth to let you focus elsewhere. You've already got next week—next year!—figured out, and you don't care who knows it. Soft, comfortable, and available in lots of colors. What's not to like? Learn what you need to know about the future of technology and trends that are already influencing plans and planning tools. If you're already feeling behind the curve with terms like "artificial intelligence," "machine learning," and "predictive analytics," get started with this or any number of other great resources. While most tabletop games rely fairly heavily on chance, Concordia lets you flex your planning muscles by allowing you to map out your upcoming moves several turns in advance. Set your goals, enact your plans, and try to outpace your opponents in this game of trade and economic expansion that's easy to learn and fast to play. Multiple expansion packs are also available. Rigid plans break easily, so being able to adapt with flexibility, grace, and speed are key. The skills taught in improv are widely applicable in business and other areas of life and you don't need to have a theater background or feel like an actor to learn them. Most local communities have theaters or programs that teach introductory classes, and they're worth seeking out! Urban planners, this one's for you: learn architecture design basics using the world's favorite toy. This kit isn't cheap, but it includes more than 1,200 pieces and a 272-page guidebook written by leading architects, and it's been endorsed by multiple leading architecture firms. Zapier is a service that creates automated workflows between tasks you perform within other apps and services daily, allowing you to quickly build processes that improve efficiency. Want Gmail attachments to automatically download into Dropbox and then notify you via Slack that it's done? No problem! At the time of writing, Zapier connects with more than 1,000 apps and services. While it's free, their premium plan allows for longer workflows and priority support. Get up to speed on (or go deeper with!) one of today's most popular mainstream techniques for planning and organizing life's details. Written by Ryder Carroll, the creator of the original Bullet Journaling system, this book unpacks more of his vision for "intentional living" by eliminating distractions and focusing on what's most important and meaningful to your life and work. For those times when you (or someone you know, technically, but we all know who this is for) just don't have enough hands or time, it's now possible to hire a personal assistant for a day–or even just a few hours. In today's gig economy, many staffing agencies now offer the option to hire assistants on a (very) short-term basis so you can get help with an event, catch up on emails, or organize a big project. Alexa, Siri, and Google are now household names, and their capacity to assist is growing all the time with a number of innovative new interfaces. Whether you're just planning your schedule and grocery list, or automating the rhythms of your home by connecting your thermostat, lights, and other appliances, these smart devices place the voice-activated home of the future squarely into the realm of the possible present. What would a gift guide for planners be without, you know, an actual annual planner on it? There are so many different styles to choose from, but this is one of our favorites. Its portable size, lay-flat binding, ideal paper weight, variety of covers, and stylish Japanese touches make this an elegant and thoughtful gift that, for an item that's in such constant use, should be more than merely "functional." Did we miss your favorite gift idea? Let us know in the comments below! Disclosure: None of the companies, products, or services paid for placement on this list in any way. Now that Lego Architect looks pretty cool... self-gift maybe?